there is much to do and see in this footprint-free paradise. The main island, Great Exuma, is 37 miles in length and joined by another smaller island, Little Exuma by bridge. Spend the day swimming and snorkelling the Tropic of Cancer Beach, aka Pelican Beach, made famous by the filming of Pirates of the Caribbean. Jolly Hall Beach and Coco Plum Beach also make for nice day trips, with long sweeping beaches of powdery soft sand and turquoise waters. A trip to Exumas isn’t complete without a tour of famous Pig Beach, the uninhabited island and official home of the swimming pigs! From fishing to sailing, snorkelling and windsurfing, Exuma is an adventure lover’s dream. Swim with nurse sharks at Staniel Cay or go cave diving at Mystery Cave in Stocking Island. No matter what you do, you’ll enjoy your time in this laid-back yet elegant setting. 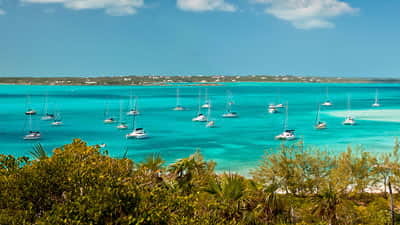 With sunshine year-round, you can travel Exumas practically any time. However, June through October are rainy season with high winds, cloudy days and humidity.